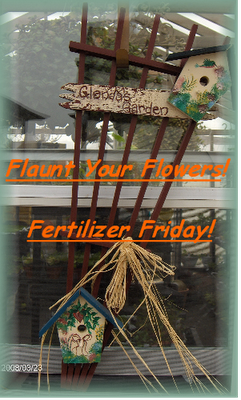 Tootsie Time: Flaunt Those Flowers...Fertiizer Friday is here!!! Flaunt Those Flowers...Fertiizer Friday is here!!! Welcome!!! I hope you have your fertilizer ready!!! Today is Friday...and today is the day we feed our flowers!!! After you feed those beautiful plants...link up...grab my photo and join me for Flaunt your Flowers!!! Add yourself to the mister linky at the bottom of this post and share with us all the wonderful flowers you are growing and enjoying! Okay..link up...I do hope it works...Mister Linky has a few issues this week!!! This is ridiculous...why won't it show up???? ?